Remember the premise for the long-running CBS series Northern Exposure? Arrogant city slicker doctor sets up practice in a tiny Alaskan town where he’s faced with all manner of peculiar local characters? Now transport that concept to England and you’ve got the basic setup for the long-running ITV series Doc Martin, with one important twist: this doctor has a crippling fear of blood. He’s also seemingly misanthropic and a total social misfit, making him perhaps the oddest and least likable of all characters inhabiting the charming fictional seaside village of Portwenn. In spite of his prickly personality, the series quickly and consistently captivated me and left me longing for its return to production later this year. For other new viewers or fans of its current US broadcast run on PBS, you can now own and catch up on the previous four series in this handy new DVD box set. The tight-knit community of Portwenn is all atwitter about the arrival of their new general practitioner, a tall and brusque middle-aged former surgeon from London. He’s not a complete stranger, as he grew up in the area under the care of his farmer aunt, but he’s been away in the big city for long enough that he no longer has anything in common with his former hometown. The locals quickly find that he has absolutely no bedside manner, preferring to address his patients with cold hard facts about their conditions with no attempt to filter his impact. It’s not that he’s purposely rude, that’s just his warped personality that we eventually learn was at least partially shaped by his unloving parents. He also becomes violently ill whenever he sees blood, a condition that forced him to abandon his successful career as a surgeon and continues to plague him in his new life in the slow lane. Each episode finds the doctor (Martin Clunes) assisting a patient or two of the week, usually discovering the cause of their illness or heroically saving their lives by the end of the show. Outside that simple premise though, the show weaves a larger tapestry exploring the ongoing relationships of the fascinating locals, with special emphasis placed on the topsy-turvy romance between the doctor and the lovely and charming head schoolteacher, Louisa Glasson (Caroline Catz). The series is also completely defined by its setting, shooting nearly everything in the tiny and fantastically picturesque fishing village of Port Isaac in Cornwall on the southwest tip of England. The show is consistently strong throughout its run, although I found the doctor to be particularly unlikeable in series two as the character veered too far into the realm of an unfeeling cyborg, making his ongoing relationship with the always warm Glasson increasingly unlikely. The character recovers his footing in series three when he reveals his feelings to Glasson, leading to a brief romance in advance of a planned wedding that comes off as a bit rushed and far too contrived by the writers. However, this opens up to a big surprise in series four that carries through to its amusing and heartwarming conclusion, exposing new emotions in the doctor to set up his continuing adventures later this year. 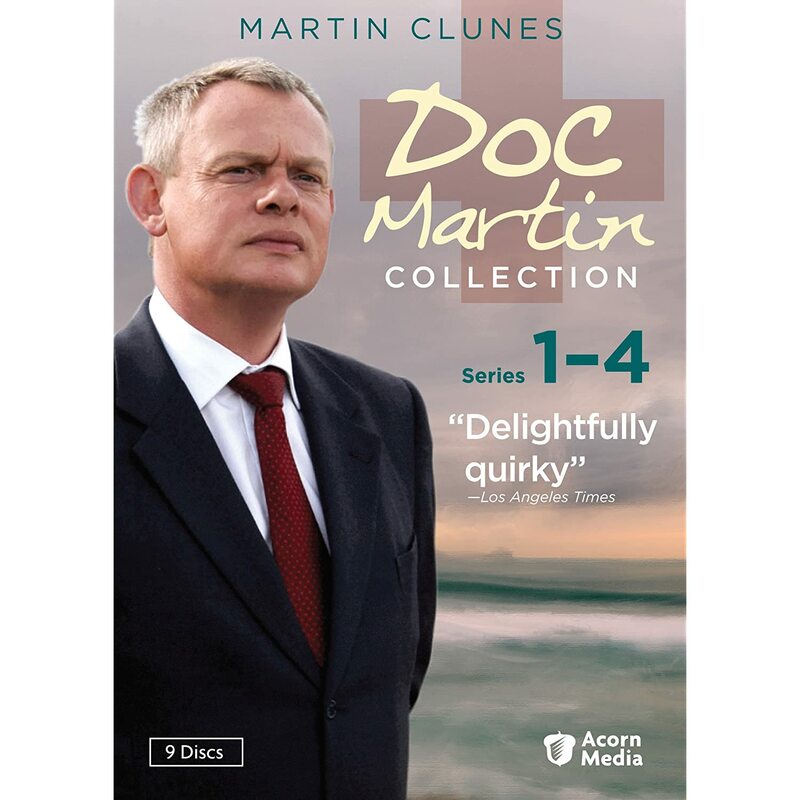 Doc Martin Collection: Series 1 – 4 is available on DVD on April 26th, 2011. Each series is housed in a full-size DVD case and all four cases are stored in an outer slipcase. There are barely any bonus features, with just some cast filmographies and trivia scattered around the discs. English subtitles are available on all episodes. The content is no different than the individual season DVD sets previously released, aside from the box set’s lower combined price point, so if you already own the individual series sets there’s no reason to move to this new box set. Trivia time: the closing credits of each episode indicate that the show arose from a largely forgotten film called Saving Grace co-written by and co-starring Craig Ferguson. Yes, that Craig Ferguson, the current host of the CBS Late Late Show. The one with the robot co-host. Not sure if that means he’s getting a cut of the ongoing success of Doc Martin, but it was an interesting connection to me. Doing my due diligence to suss out the character origins of Doc Martin, I gave the film a spin and found it to be similar to Weeds (or vice versa, as it predated Weeds by a few years), with a poor conservative widow turning to marijuana cultivation and sales to support her household. Clunes is in the movie in a small supporting role and it also takes place in Cornwall, but his doctor character is nothing like Martin, with floppy hair, a ready smile, and easy friendships. So yes, it features a doctor in Cornwall but the similarities seemingly begin and end there. Seriously Steve, you had me at "doctor with cripping fear of blood." Love the concept, and it seems like the Brits have a knack for injecting the right set of quirks into a mix to make for fine hours of television. Also -- feeling bit lazy to check myself but I know I've seen Clunes before, can't quite place where.